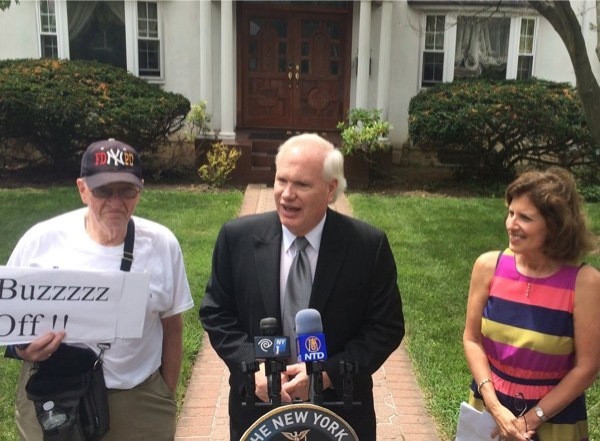 State Sen. Tony Avella, Vice President of the Broadway-Flushing Home Owners’ Association Maria Becce and other residents stand in protest against an Airbnb listing which violates local zoning. State Sen. Tony Avella (D-Bayside) stood with residents of Broadway-Flushing to protest an Airbnb listing which he has called a violation of city zoning laws on Friday. The home, located at 35-32 159th St., has been rented out to dozens of people at a time for private parties, as well accommodating an illegal renter in one of the rooms, according to Avella. The large white house is a major problems for neighbors who say their street is overburdened with parked vehicles and strangers who come and go in violation of the one-family home zoning in the district. Avella expressed frustration with the city Department of Buildings for not enforcing these laws. “This listing represents everything that’s wrong with Airbnb, and why further regulation is needed to rein in the share economy. This is a quiet, residential neighborhood and the advertisement is encouraging large groups to come and hold events, creating a revolving door of unknown groups of people. Using this home that way is completely unacceptab­le,” Avella said. Maria Becce, vice president of the Broadway Flushing Homeowners’ Association, said the listing first came to their attention in March and a letter was issued to the owner explaining they would see to it that the zoning would be enforced. The listing was taken down, but only temporarily. “The Broadway Flushing Homeowners’ Association will remain vigilant and we will make sure the city protects our zoning. We will go to court and use our own funds to enforce the covenant, and please remove the listing from Airbnb,” said Becce, who added that lawyers from the association have issued a cease-and-desist letter to be delivered to the owner of the house. Avella said he has requested that the DOB enforce the zoning code as well as make contact with Airbnb to have the listing removed once more. He and Becce contend the house qualifies as an illegal hotel with an absentee homeowner. Avella said the original listing did not cause as much of a stir as the new listing, which was re-established a week prior to the news conference.